Track 10 recorded July 1962; tracks 2,3,6,8 recorded Sep 5, 1962; tracks 4,5,7,11 recorded Sep 6, 1962; tracks 1,9,12 recorded Sep 7, 1962. The Lp was released in October 1962. Snowbound together, we’re snowbound together. Two together snowbound, blessing the storm. This is an excellent example of this man’s genius. In later years, I would have the good fortune to see him do this on countless other occasions. Yo, Ray! Outstanding performances are the rule rather than the exception with Ferrante and Teicher. Thus it is no surprise that SNOWBOUND continues the pattern of complete entertainment, excellence of performance, and offering a musical program with appeal to all who enjoy music, from the Teens to their grandparents. 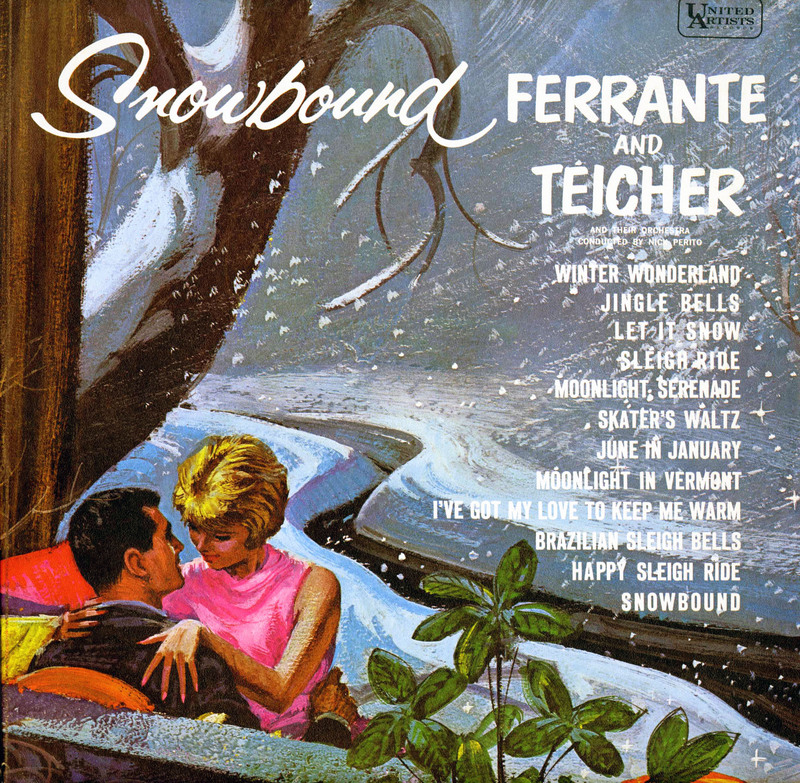 Seated at their twin pianos, Ferrante and Teicher paint a magnificent musical scene of a Winter Wonderland in this album. From the typical American Sleighride to Brazilian Sleigh Bells and the Russian Sleigh Song the listener is transported through a true Fairyland, complete with the luxurious backgrounds which have become identified with the Ferrante and Teicher best-sellers. There is no season of the year more compatible with music than Winter. Indeed, being Snowbound with Ferrante and Teicher can, and in fact will, provide an unforgettable experience. It makes no difference if you are warm in an apartment or penthouse, or curled up in front of a roaring fire as the snow falls outside, the music will fill your home as it moves from one song to another, each carefully selected to maintain the mood of the album, and to offer the ultimate in enjoyment. It is well to note that the Moonlight Serenade arrangement was done by Don Costa, Snowbound by Nick Perito and the balance by Ferrante and Teicher. We think you will agree that all are exceptional in every respect. Like many of the 1980s Liberty reissues, this album was available on Lp and cassette in an abridged format. They omitted "Skaters Waltz" and "Moonlight Serenade." They butchered the cover, removing "Skater's Waltz" but leaving "Moonlight Serenade" in the listing!